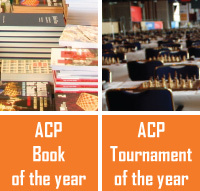 We would like to inform you that the voting for new ACP Board is now open. All Premium and Standard Members (for over one year) can cast their vote(s) following this link. Just to remind you, there are 15 candidates for the new board. You can see their CVs here. The voting will take place until 1 March. We would like to invite you to make your voice count. Follow this link and let's continue making the chess world a better place!